This article describes a scenario for Tod Kershner's Pig Wars Dark Age skirmish rules. In this scenario several units of invaders pillage and loot a town taking livestock, gold, and prisoners. Each player controls one unit of invaders, but the number of units and invaders is limited only by the size of the gaming table and the size of the village. The rules are geared to make a fast and fun game for players of all experience levels. The goal of the game is to take as much loot as possible with the fewest casualties and return to your homeland with riches and plunder. Beware, the town is inhabited by Angry Villagers and the King's Guard who will do all they can to protect the town and drive off the invaders. This scenario follows Tod Kershner's Pig Wars Dark Age skirmish rules except as amended below. Rather than use cards, it is recommended to use Michael Miller's Dice Based Pig Wars Chart which relies on a D10 and D6 rather than playing cards. Be aware that the current version of Michael Miller's chart has several errors or unclear items. Under Movement Factors, the parenthetical information is the movement distance in inches for a figure in difficult/rough terrain. Under Shooting, the block roll for unarmored (UA) figures should be 8-10, not 5-10 as listed. Under Melee, no mention is made of the 2 and 14 die roll limits. Use these limits as it makes leader-to-leader combat quite interesting. Under Morale, the Situational factors are +1 and -1 changes to the unit morale level and not the dice roll. Each player should have a D10 die, 2 D6 dice, and any other gaming implements such as measurement devices. Each player should have a unit of 12 miniature figures. The theme of the rules are the Dark Ages, but most any type of miniatures will work: Picts, Late Romans, Vikings, Celts, Anglo-Saxons, Normans, or Germans. Figures must have cloth, fur, or little clothing - no plate or chainmail is allowed. Shields slung on back are acceptable. Slings, javelins, bows, and crossbows are acceptable weapon types. Use the proper range for the weapon carried by the miniature. Slings are treated as bows for range purposes. Each missile fighter is considered to have a +1 weapon (dirk or dagger) for use in melee combat. These figures may have leather armor or cloth and shields. No plate or chainmail is allowed. These figures may have chain mail, plate and shields. Figures should be individually based but otherwise need not follow any sort of basing convention. As long as all figures are similar scale, use range and weapon reach to determine which figures are within striking distance. Set up a village of miniature buildings on an appropriately sized table. Follow history books to create an appropriate village: a church in the center, perhaps an inn or tavern, a tower or guard post on the outskirts, and many hovels or barns. Most villages have a river or stream and forests nearby. The number of buildings and size of the table depends on the number of players and attacking figures. The buildings should be placed in the middle 50% of the table to allow some contact and battle outside the village. The village should have two or three rooms for each player. The larger buildings such as churches, taverns, and towers may have multiple rooms, but as this is the Dark Ages, most buildings have a single room. Around the buildings place trees, walls, hedges, rivers, and crops. As with building rooms, form areas with the scenery to contain villagers and loot. Among the scenery place plenty of livestock - chickens, geese, goats, sheep, pigs, cows, and horses. Place a few farmers and shepherds about the town. There are four types of inhabitants in the village. All may be placed visibly in the open (revealed) at the start of the game or hidden (unrevealed). Hidden figures will appear when an area is entered by a player figure. See "Inhabitant Behavior" to understand how to reveal and capture inhabitants. See the "Loot Table" for an example of how to populate the village with hidden inhabitants and loot. Livestock - chickens, geese, goats, sheep, pigs, cows and horses. Livestock are an important commodity of this farming village. Nearly all villagers raise some form of livestock. These are frightened villagers who will never fight the invaders. Whether coward or child, these people tremble at the sight of violence and never put up a fight. These are villagers who are angry to see their village and way-of-life sacked by foreigners. They grab the nearest weapon and confront the invaders. Most Angry Villagers are unarmored (UA) with improvised weapons (0) or shield/club (+1). Use the miniature to indicate weapon type. Morale level is untrained. These are hired professionals in service to the local lord or king. They protect the town at all costs. Most are partially armored (PA) with spear/club (+1) or single-handed blade (+2). Morale level is average. All players should start equidistant from the village. Position around the village should be determined randomly. Order for each turn should also be determined randomly using die rolls or cards. An additional turn card should be used to indicate the move for the village inhabitants. All revealed inhabitants move and perform actions when it is their turn. When a player figure enters a room with unrevealed inhabitants or loot, the contents are revealed and immediately placed on the table. Livestock and Docile Inhabitants that are revealed (either at the start of the game or during the game by entering an area) do not move until an attempt to capture is made and failed. Then they scatter in a random direction and distance as described in "Capturing Inhabitants". Angry Villagers and Town Guards that are revealed normally move when an enemy is within line-of-sight, and it is the villager turn to move. Then the Angry Villager or Town Guard moves its UA PA or FA movement rate, charging if necessary, toward the nearest enemy. Additionally, when revealed by a player figure entering an area, Angry Villagers and Town Guards may get a free move. Roll a die. On an odd roll, the Angry Villager or Town Guard says "That's odd! ", is momentarily perplexed by the invading player figure, and does nothing. On an even roll, the villager or guard immediately moves or attacks the nearest invading figure as if it were the villager turn. All inhabitants whether livestock, villager or guard are subject to capture by the player figures. Each fighter is assumed to have rope with which to capture livestock and prisoners. An unlimited number of livestock and prisoners and may be captured, tied, and lead back to the player's entry point on the game table to score victory points. To capture an inhabitant, move your figure next to the inhabitant in melee combat position, and roll its capture roll successfully. The capture attempt is done in lieu of a melee attack on your turn. Once captured, line up livestock and prisoners behind the captor. A fighter's movement distance is halved when dragging one or more prisoners. When a capture attempt is unsuccessful, Livestock and Docile Inhabitants will attempt to flee/scatter. Angry Villagers and Town Guards do not flee after an unsuccessful capture and rather continue to fight on the inhabitant turn. For scatter, roll 2D6 for the distance (in inches) that the figure will scatter. Randomize the direction by rolling a D10 and using the point of the die to indicate the movement direction. When a unit hits a wall, hedge, or other obstruction, continue moving the figure along the obstruction until the movement distance is reached. Some fleeing figures will run around the walls of a room and end very near the would-be captor - such is the effect of panic and fear. Ignore the attacker. Attacker and captor have combat, but the captor must ignore all weapon modifiers. Tactical modifiers such as hills and mounted apply, but the captor is also considered as being attacked against an unshielded flank. The captor continures to drag the rope and the prisoners on the captor's move. If the captor is killed, all prisoners immediately scatter. Confront the attacker. Attacker and captor have combat as usual. Apply all bonuses for weapons and tactical situations (hills, mounted, etc.) The captor drops its rope and all prisoners immediately scatter as with an unsuccessful capture. Freed Angry Villagers and Town Guards will move and attack again on their turn after scattering. Unlike the official Pig Wars looting table, this scenario has alternate looting rules made for quick-play and ease-of-use. In each interior room or enclosed outdoor area place a chit or tile with a letter or number. When a fighter enters a room with an undisclosed tile, the tile is revealed, its value is read from the loot table and immediately placed on table. In this scenario, gold is kept in neat leather sacks which may be accumulated and carried off the game table to score points. Use chits or other markers to indicate a figure's captured treasure. If a figure is killed, immediately transfer the gold to its killer. Here an example loot table is provided that uses Scrabble tiles. Since there are 100 tiles in a standard Scrabble set, you may substitute a similar treasure distribution such as the column that suggests D100 die roles. However, tiles are prefered over dice rolls because as the tiles are revealed, played, and removed, treasure becomes scarce and the game is drive toward its conclusion. This table is geared toward 5 or 6 raiding parties. If you have more or less raiders, adjust the values in the table by more or less. Similarly, to make a harder or easier scenario, the values may also be moved up or down. Each fighter that dies costs the owning unit 5 points. Assuming two invaders plunder the same amount of loot, the better is the one that does so at the least cost of life. Figures may attack and kill other invading figures, but at no benefit to the survivor. The only benefit is to hinder or steal from your opponents. It is recommended to use all basic Pig Wars rules and avoid all optional or addendum rules. Other changes and clarifications are given here. Use the normal movement and shooting rules for archers. Allow archer firing up to the limit of movement, but do not allow two shots for stationary archers. Ignore the Leader Combat rule that causes a Leader to die with one hit. Instead, ignore rolling for instant death and allow three wounds for all leaders. 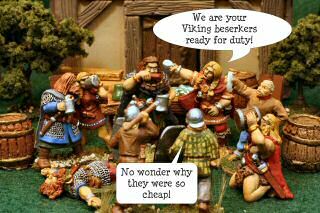 Since pillagers will run in and out of buildings and alleys, ignore the morale effects of standards. Capturing or moving out of line-of-sight of the standard has no effect in this scenario. Any mounted rider with a lance, spear, javelin, or other pole weapon uses the weapon as a lance during a charge and qualifies for the deadly +5 bonus. However, on non-charge mounted attacks, these weapons count as a +1 spear. In both cases, apply the mounted versus non-mounted bonus (+1) against foot soldiers. This scenario is based on 12 figure units. Take a morale check when a leader is lost or a cumulative 1/3 of the unit is lost. For example, with 12 figure units, when 4 figures in a unit are killed, that unit takes a morale check. When 4 more figures in the unit are killed, take another morale check. With the dice based Pig Wars there is no hold card. However, to simulate the effect of the leader, allow one free die reroll at any time during the game. Missle shot, melee roll, morale roll - the leader has the powerful effect of saving someone or urging someone on to deadly effect. When a figure returns to its starting area, it is removed from the game and may not reenter play. Once all figures die or return to their start positions, or players mutually agree, the game is ended. All treasure is tallied. All casualties points are subtracted. The player with the most victory points wins the game. It is hoped that these rules make a fast and fun afternoon for all participants. Note: One account of this scenarios is described at "Pillage the Village" Pig Wars Game on 2004/10/17. Last modified: Thursday, 09-Jun-2011 12:39:03 MST.